The figures from the 20th (Central Ontario) Battalion, CEF, as with all of the figures in the 4th Brigade, are from 1st Corps. The formation patch for the 20th Battalion was a green triangle surmounting a blue patch – the blue patch was for the 2nd Division, the triangle indicated the second battalion within the brigade and the green was the senior brigade within the division. I’m skipping on past the 21st Battalion for now, and going to get working on the 5th Brigade for the moment (because I need to convert/repair a figure to finish up the 21st Battalion and I’m all out of Green Stuff…). 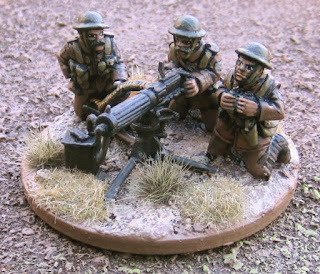 Three newly painted Highland Dwarves and a Horn Blower for a Mountain Dwarf Unit. 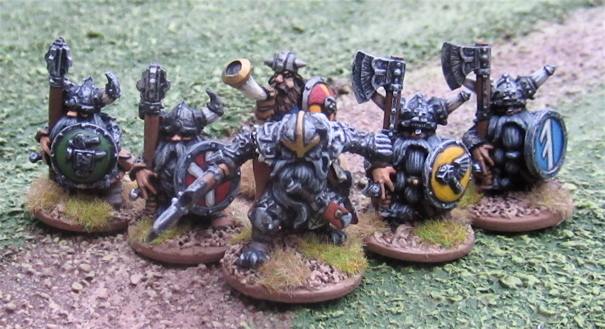 The Highalnd dwarves are from Old Glory… and I think the hornblower might be from Essex Miniatures? 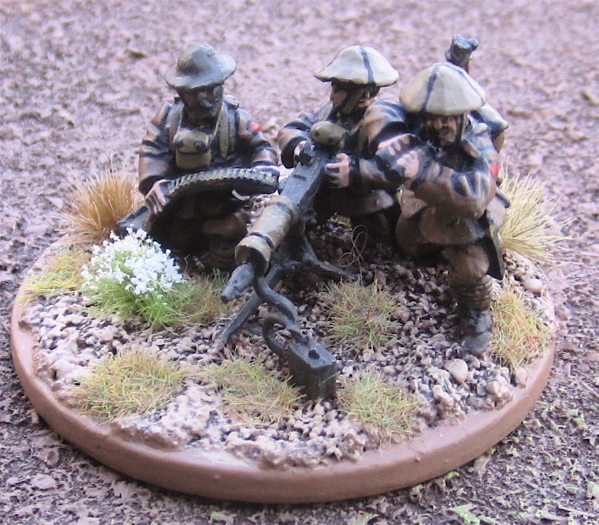 These are the three units I have complete so far for the Highland Dwarf Warband I am building for Dragon Rampant. This is the unit the Horn blower was painted for – the Dwarven Jarl and bodyguards for the “Mountain Dwarf” Dragon Rampant warband… Originally I was going to leave it with the five others (saying the Jarl himself is worth 2 strength points) but when I line up the units in the storage box and all the others are 6 or 12… the unit of five just looked out of place (does that seem a bit OCD…? I’m probably a bit OCD…). I also finished up this Elf Champion – the figure is an old Celtos figure, which are currently available through Brigade Models - I actually just ordered a few more Elf archers to finish up a second unit of them for another Dragon Rampant warband. 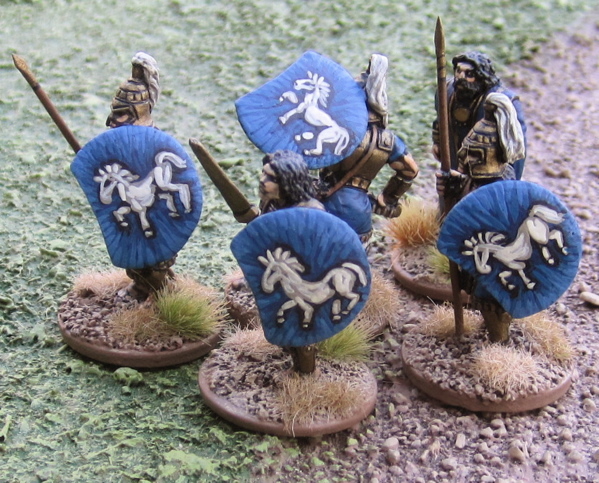 The warband will be made up entirely of Celtos “Sdihe” figures. It will include two units of archer (Light Missile, Sharpshooters @6), two units of spear (light foot, @3), and this fellow as a single figure (or perhaps reduced figure - I might have a standard bearer and musician that could join him…?) unit of Elite Foot (@6 points). I also have a goofy looking magician for the force that I could potentially use (not sure how I’d rearrange the force to field him, though…). Well with that all out of my system, hopefully I get on to finishing up the 4th and 5th Canadian Brigades for the Vimy Project!! I haven't been terribly productive this past week for… reasons… Largely I spent a couple evenings just taking stock. I’ve been getting distracted thinking about future projects. NEW future projects and I thought perhaps it was time to do a little stocktaking – mostly to shame myself into not considering any new projects for the next year or so… but more on that in another post…. 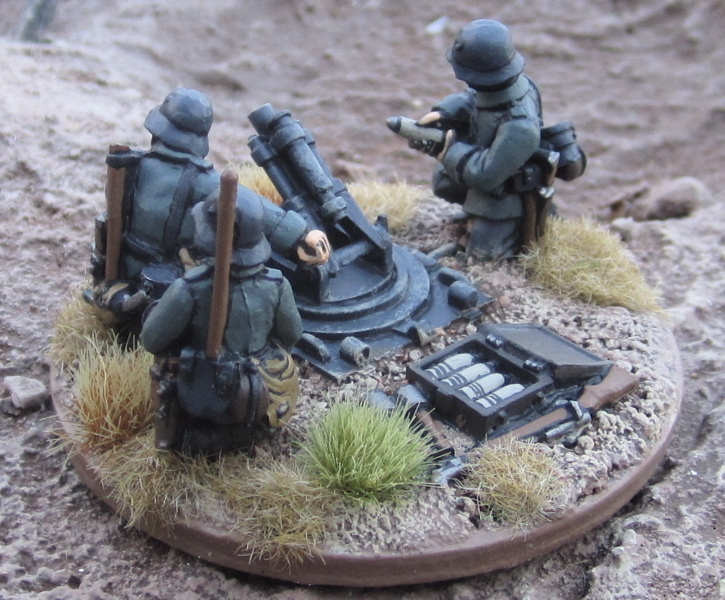 I DID manage, in the meantime, to finish up this little German trench mortar team from Great War Miniatures. Lovely little kit. Very easy to put together. 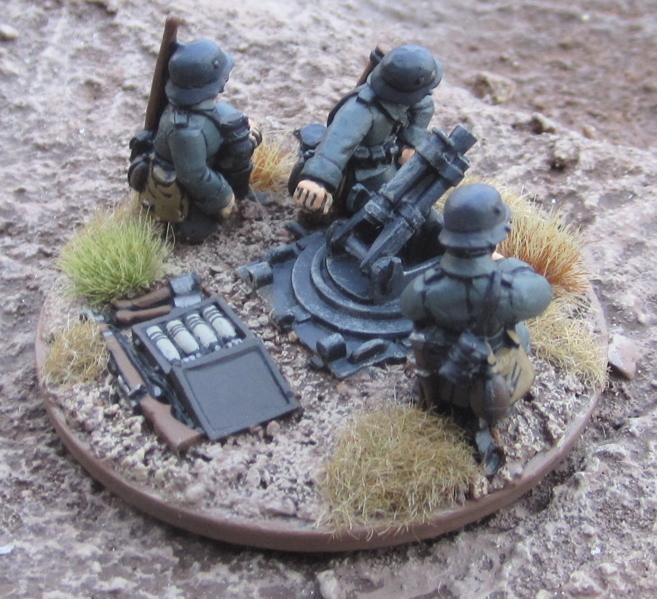 I particularly appreciate the little details GWM throws in with these kits – the case with mortar bombs and rifle, etc. 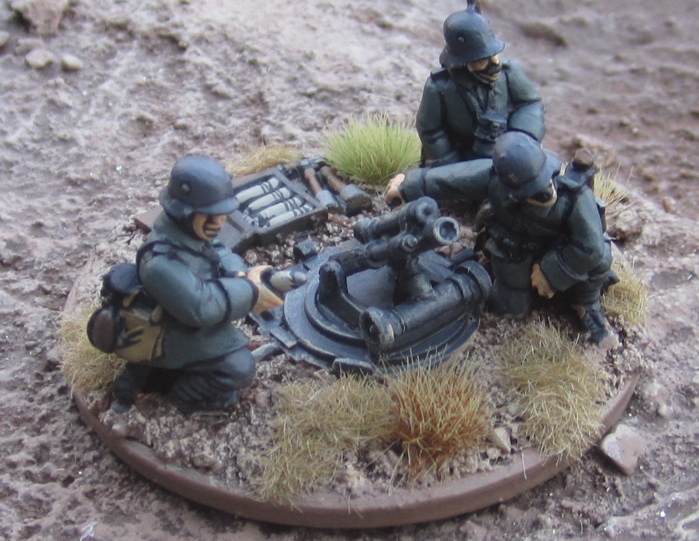 Anyone care to guess at how many 28mm figures I have and what portion of them are actually painted? I tell you what - if I get at least six guesses I'll post the results. 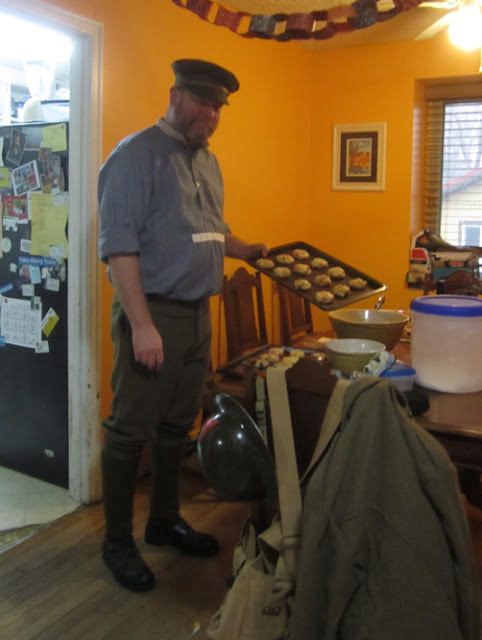 And back to the Khaki…. 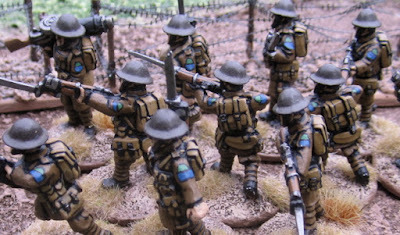 The figures from the 19th (Central Ontario) Battalion, CEF, as with all of the figures in the 4th Brigade, are from 1st Corps. The formation patch for the 19th Battalion was a green semicircle surmounting a blue patch – the blue patch was for the 2nd Division, the semicircle indicated the second battalion within the brigade and the green was the senior brigade within the division. So how many “little breaks” do I get to take from a project before I can consider myself “totally distracted”…? Ancient Persians from Casting Room Miniatures (who are currently having a “pre-xmas” 20% off sale on their historical miniatures like these – I did not pick these up in the sale. I’ve had these a while. Though I’m not entirely sure WHEN I picked them up… probably a year and a half ago when I was picking up stuff for Song of Shadows and Dust. Thracian Women from Wargames Foundry which is the same guys as Casting Room Miniatures… but a different website – which is SUPER annoying because orders cannot be combined If I want to order 4 packs from one and 4 from the other I have to pay twice the shipping I would if they were all from the same website – actually at 8 packs (combined) it would ship free from one or the other…. (unlike… say… North Star Figures which also sells Artizan Designs and Copplestone Castings and Crusader Miniatures and maintains separate websites for each of them – they all go to the same cart and orders can be combined). Here’s what their backsides look like. Gorgons! 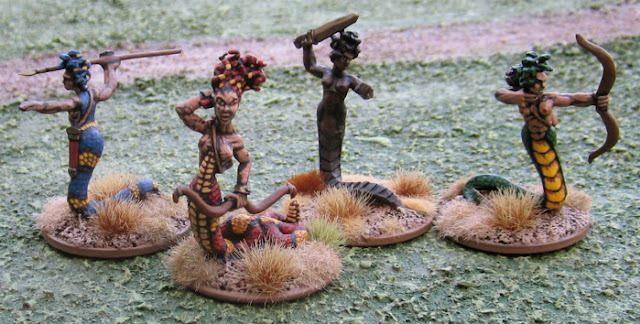 The one that is primarily red and yellow (tried to go for a Corn Snake look) is from Reaper Miniatures, the other three are from Wargames Foundry or Casting Room Miniatures… I forget which… I think they may be the one line that is available through BOTH websites! The Black Snake gorgon I actually painted… um… wow I guess it was over four years ago - but I’ve included her here with the others because… well.. they’re all done so I thought I’d take a picture of the group….? 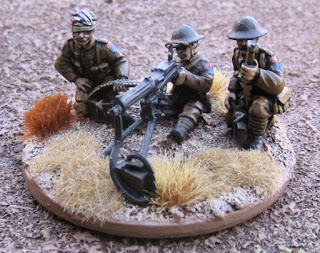 Back to the Great War Canadians… no, really… the 19th (Central Ontario) Battalion is the only thing on my workbench and I’m not putting anything else on there until they’re done! 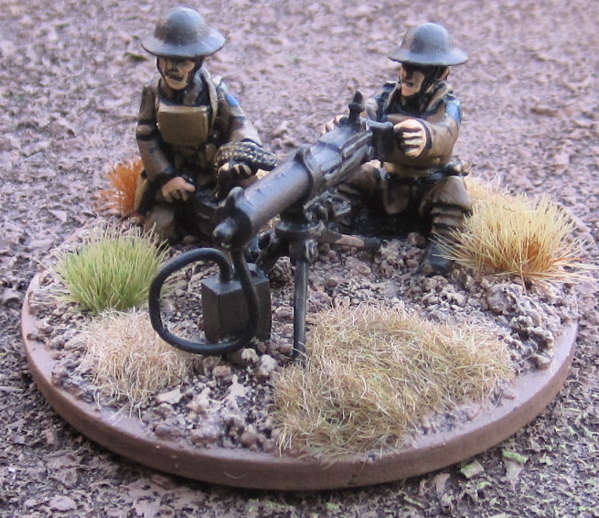 I just finished up the last of the Great War Canadian Vickers machine-gun teams I currently have (I do need a few more, but I’ll probably be waiting until the new year to pick them up). 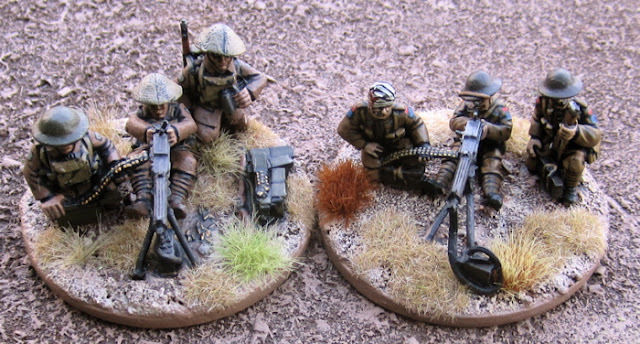 The new teams, from left to right: 1st Corps, Gripping Beast/Woodbine Design (in back), Wargames Foundry (in front) and 1st Corps again. These are all of the teams for the Canadian Corps so far. There will be four per division and represent roughly a company. I need about three more. Having finished them up I thought I’d do a post highlighting all of them and maybe even taking some comparison shots. Here are a few comparrison shots.. 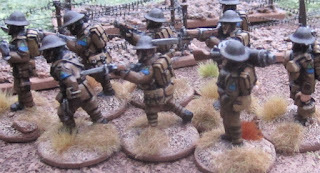 Here I tried to line them up from biggest to smallest guns - left to right: Renegade Miniatures, Brigade Games, 1st Corps, Great War Miniatures, Old Glory, Gripping Beast/Woodbine Design, Wargames Foundry. As above, slightly different angle. The biggest and smallest. 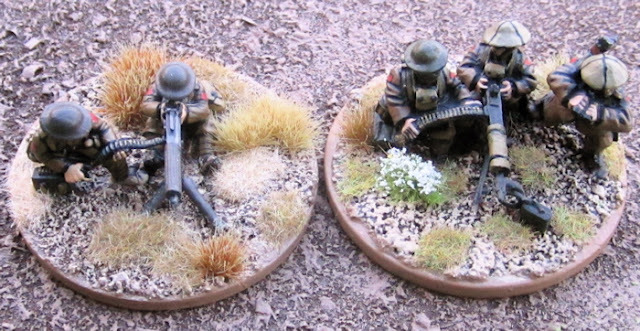 Wargames Foundry on the left, Renegade Miniatures on the right. I originally took a few more pics but a lot were out of focus or just didn't turn out, but I think the above does a pretty good idea of showing the differences and similarities. I'm not terribly concerned by them. 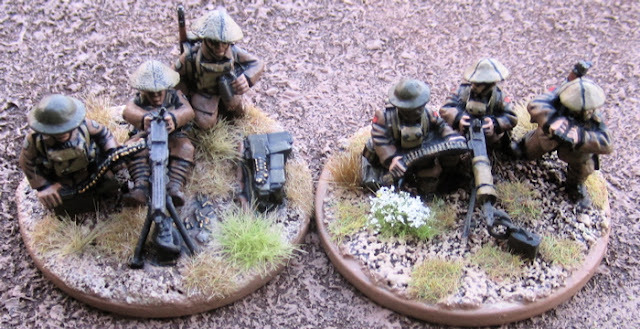 These will be spread out all over teh battlefield - the differences are really only noticable when you line them up next to each other and critically compare. 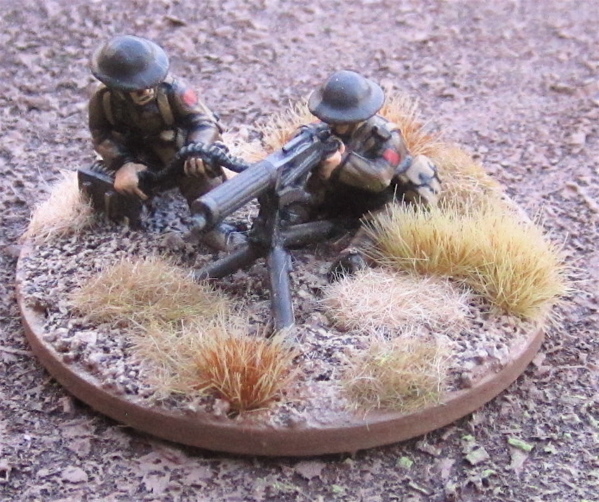 I realized afterward taking and editing all these pictures that I do actually have a vickers team from Battle Honors - but they're in shorts and Wolseley helmets... I guess they'd do to show relative sizes of guns... Ah well... some other time. 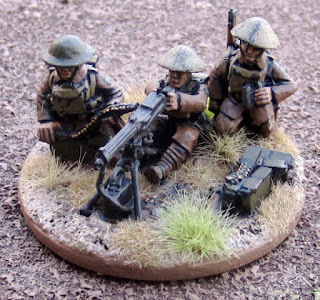 I wish I could say it would be the 19th (Central Ontario) Battalion, CEF, but it won’t I have a few more individual ancient figures I’ve been working on in between units and stuff. I have STARTED the 19th (Central Ontario) Battalion, and hopefully I’ll be posting them later in the week! 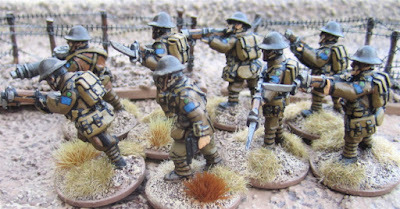 Also work has slowed on the 4th Brigade as I’ve stopped to convert a few spare officers into the riflemen I need them to be! 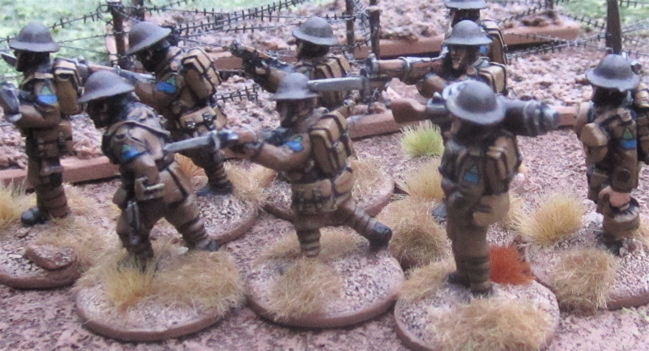 I finally finished up the final battalion for the 1st brigade, and indeed the entire 1st Division: 4th (Central Ontario) Battalion, Canadian Expeditionary Force. 4th (Central Ontario) Battalion, Canadian Expeditionary Force. The formation patch for the 4th Battalion was a green square surmounting a red patch – the red patch was for the 1st Division, the square indicated the junior battalion within the brigade and the green was the senior brigade within the division. I was actually short a figure to make this battalion – so I pinched a couple from the 14th Battalion and replaced those with two spare figures I had from Old Glory. 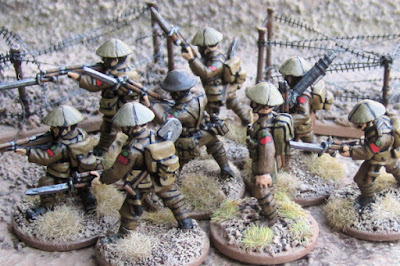 that way the entire 1st Brigade is made up of Wargames Foundry Figures, the Second Brigade is made up of Old Glory figures and the 3rd Brigade is made up of a mix of Wargames Foundry, Old Glory, and home-cast figures. Ideally I’d have liked to have the battalions made up of figures from one manufacturer (and so it bothers me intensely to have the two Old glory figues in the unit of Wargames Foundry figures… but I’ll just have to live with it – because I can’t be bothered to pay $25-$20 just to get one or two more figures). 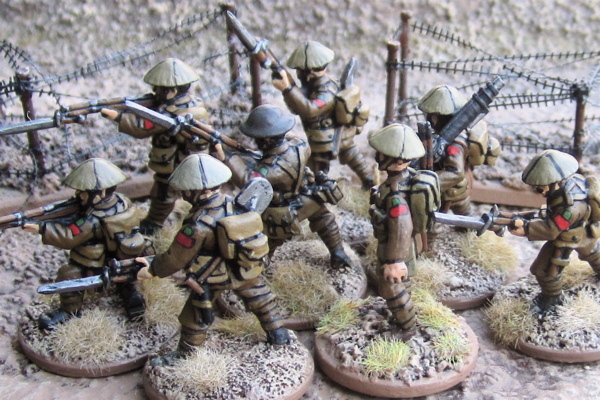 I’d take pictures of the entire brigade, but while the battalions making up the brigade, the entire brigade is not complete as I have some supporting elements that would be attached to the brigade that I have yet to complete. Same goes for the Division. On to the 2nd Division – or perhaps some Germans…? 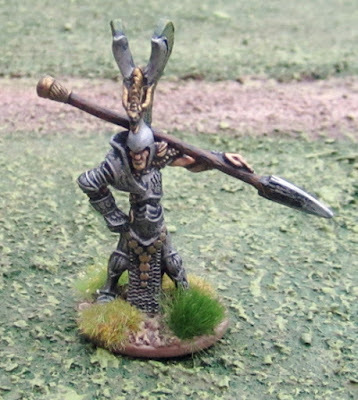 This fall I started playing in a D&D5E Primeval Thule campaign – the setting is Bronze Age Sword and Sorcery. I recalled that I had these few Wargames Foundry Trojan War heroes that I never got to finishing up when I was working on other Greek myth stuff. 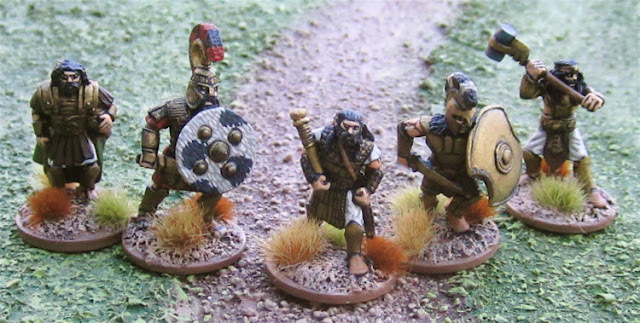 The Trojan War – historically speaking – would have been in the Bronze Age, so I painted these guys up with bronze weapons and armour. 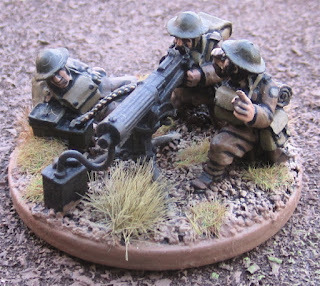 I was looking around the Foundry website and got to thinking I might order a few more Bronze age warriors – a mix of European Bronze Age Warriors and Hittites and other Trojan War Heroes to add to this mix, but then I came to my senses and… well.. didn’t… for now. Trojan Heroes. I think that’s supposed to be King Priam in the center, flanked by his sons Paris (one the left - without the helmet) and Hector (on the right), and two other guards. 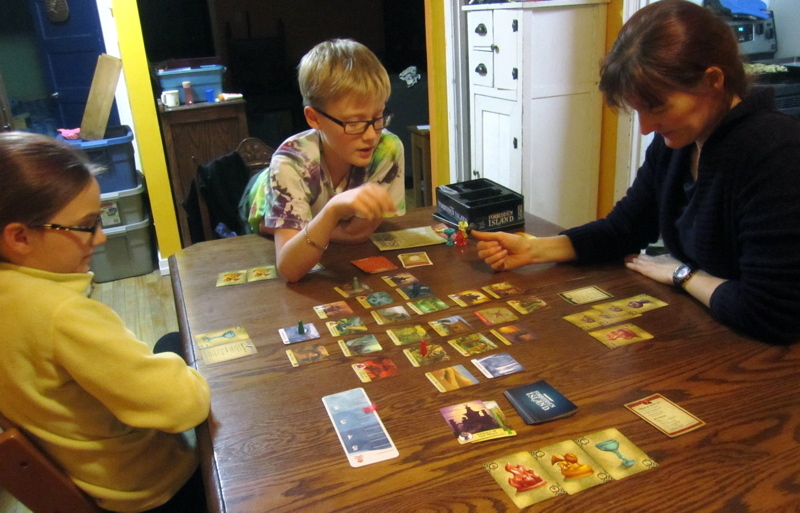 We haven’t been getting a lot of gaming in lately either, but we did sneak in a game of Forbidden Island last night. This was our second game so we played at the "normal" level and just barely made it off the island! I'm not sure how anyone could play at the "veteran" or "elite" levels! After posting pictures of the 3rd Battalion we got on with some regular halloweeniness. 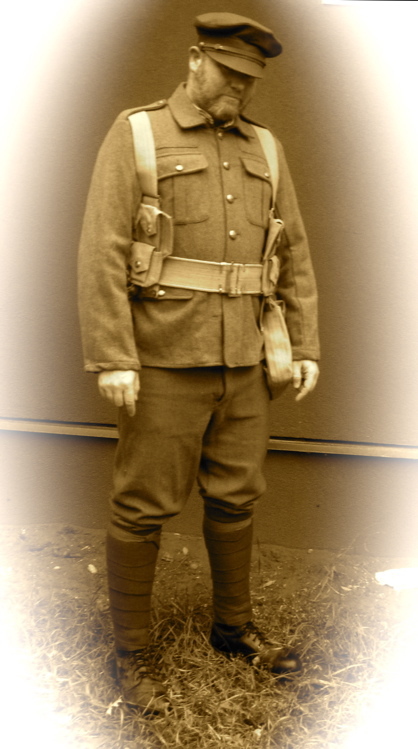 The kids got bugging me about getting out my new "costume" so I actually got out and tried on this uniform I picked up in Calgary during our summer vacation. It's a long story... (more about that later sometime). 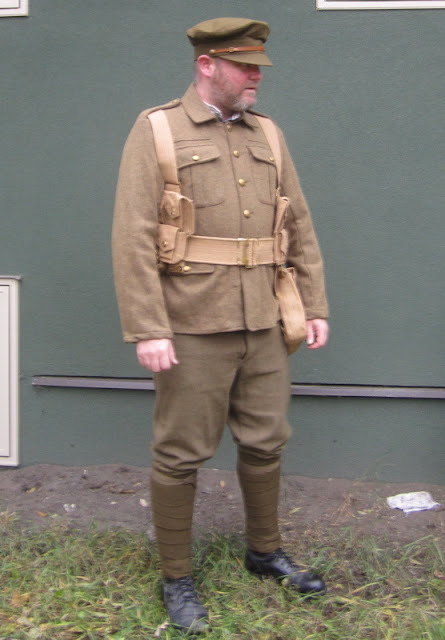 It's actually a replica Canadian Great War uniform that was used in the film Passchendaele - or at least parts of it was... 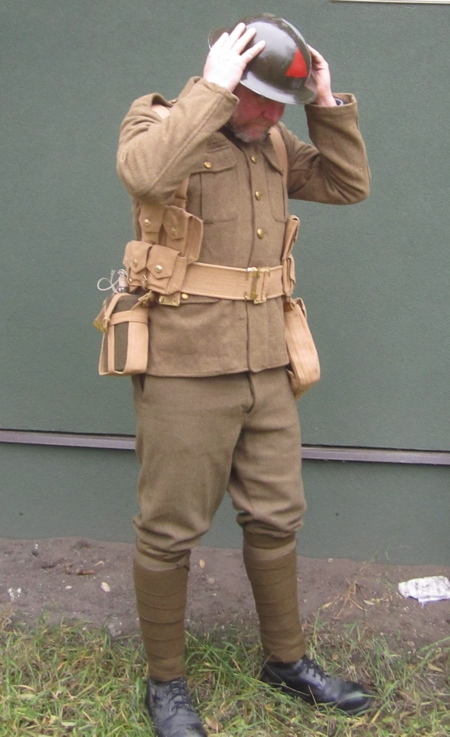 The tunic and trousers were, maybe the cap... the puttees and webbing are new replica items. I have some insignia to add to the uniform at some point, but just haven't gotten to it. Not sure if I got that webbing set up right - but I'm pretty happy with the puttees - the first one took a few tries to get it right. 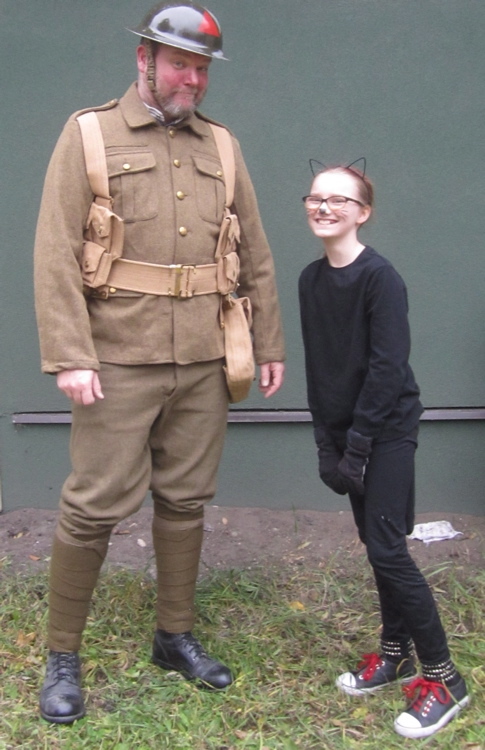 Messing around trying to make it look like a "period photograph"
The Girl also had a costume and wanted a picture with me in mine. 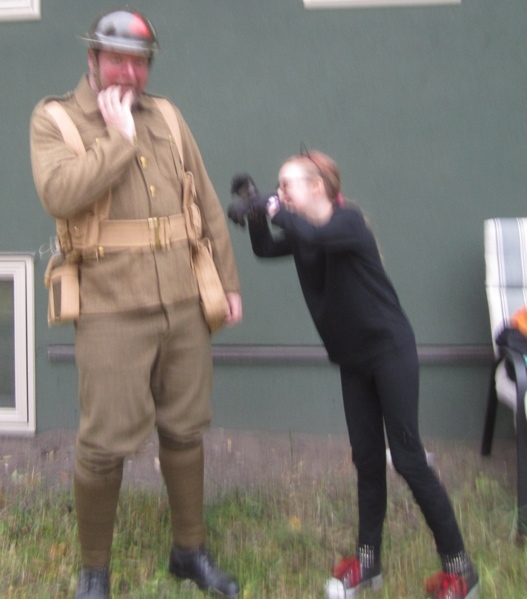 Out of focus because The Boy - who was taking the pics on this rather drab October late afternoon - was giggling too much. Afterwards we made some halloween-y cookies. Well... okay... they were kind of just regular chocolate chip cookies with yellow, orange and brown Sun Drops instead of chocolate chips... which are sort of halloween-y coloured - or at least autumn coloured. We didn't get around to carving a pumpkin this year. I don't know where the day went. I'd meant to get one carved AND play some horror themed games in the afternoon... but all we really got done was the cookies...? After supper when Amanda got home we DID get to play at least one Horror-ish themed game - Forever Young: A Vampire Game from Twilight Creations - they make that Zombies!!! game (which we don't have, but I played once... we do however have Cthulhu: Hastur La Vista, Baby and Innsmouth Escape...). I picked up Forever Young out of Dragon's Den Games bargain bin for maybe $20 a couple of years ago - intending to play it as a Halloween game - but never got to it. 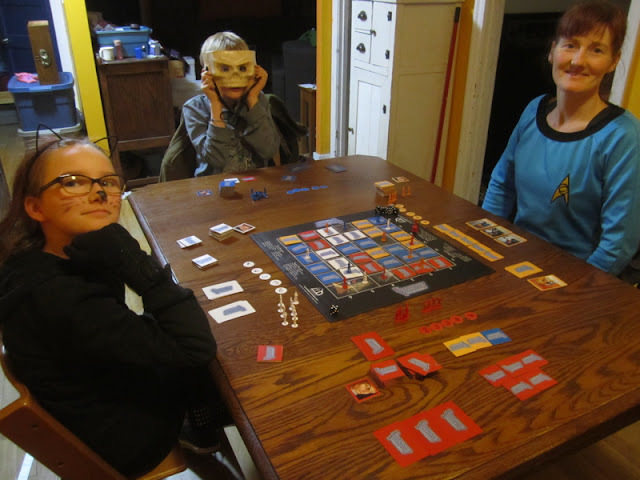 (Last year on halloween we played a Fear & Faith - Flashing Steel mash up horror skirmish game set during the English Civil War). But instead the game dragged on for almost FOUR HOURS!? I can't imagine trying to play a 6-player game!? Although once the draw decks got close to running out - it came to a pretty abrupt end in I was knocked out first - The Boy managed to kill my Vampire leader and The Girl discovered my nest... 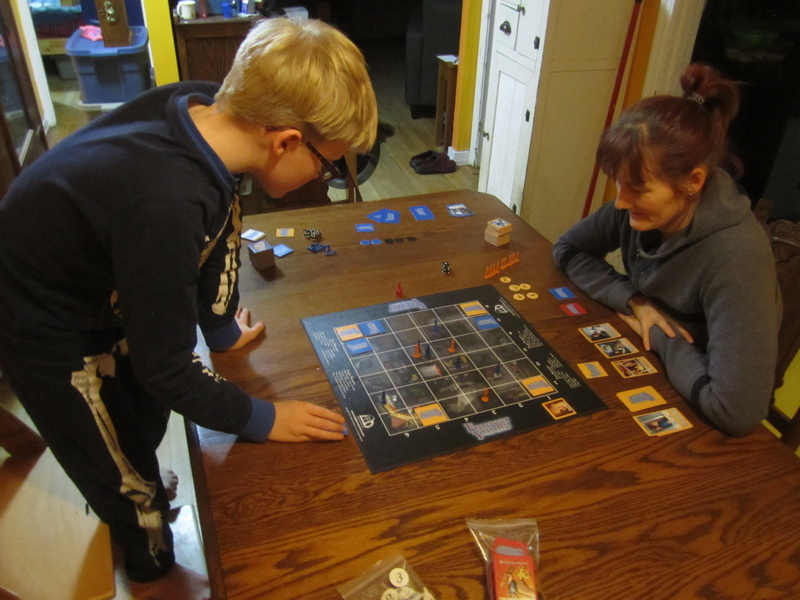 Within another turn The Girl was knocked out of the game and it was just down to Amanda and The Boy - I don't think it took more than another two or three turns - which went a LOT faster. In the end The Boy won - but it was super close! I might play it again (it would be interesting to TRY it with 6 players - just to see how it plays different...). But if I don't, it was only $20 - which is pretty cheap for an evening's entertainment (cheaper than us all going out to a movie! ).